22.12.18 09:23 Transfer Sent Payment: 150.00 USD to account U17520550 from U1294xxx. Batch: 240293687. Memo: Shopping Cart Payment. Deposit to Commercial Drones User allhyips. 26.12.18 18:11;Account;Receive;Received Payment 0.51 USD from account U17520550 to account U1294000. Batch: 240667232. Memo: API Payment. Withdraw to allhyips from Commercial Drones. 26.12.18 18:11;Account;Receive;Received Payment 0.51 USD from account U17520550 to account U1294000. Batch: 240667227. Memo: API Payment. Withdraw to allhyips from Commercial Drones. Memo: Withdraw to analysis from Commercial Drones. 31.12.18 07:25;Account;Receive;Received Payment 0.51 USD from account U17520550 to account U1294000. Batch: 241004414. Memo: API Payment. Withdraw to allhyips from Commercial Drones. 31.12.18 07:25;Account;Receive;Received Payment 0.51 USD from account U17520550 to account U1294000. Batch: 241004412. Memo: API Payment. Withdraw to allhyips from Commercial Drones. 03.01.19 19:06;Account;Receive;Received Payment 0.51 USD from account U17520550 to account U1294000. Batch: 241624205. Memo: API Payment. Withdraw to allhyips from Commercial Drones. 03.01.19 19:06;Account;Receive;Received Payment 0.51 USD from account U17520550 to account U1294000. Batch: 241624199. Memo: API Payment. Withdraw to allhyips from Commercial Drones. The amount of 1.01 USD has been deposited to your account. Accounts: U17520550->U3669097. Memo: API Payment. Withdraw to DaTre from Commercial Drones.. Date: 08:51 08.01.19. Batch: 242041340. The amount of 50 USD has been withdrawn from your account. Accounts: U3669097->U17520550. Memo: Shopping Cart Payment. 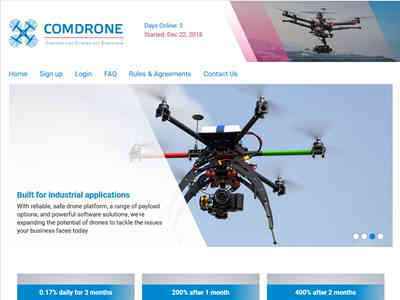 Deposit to Commercial Drones User DaTre.. Date: 07:18 23.12.18. Batch: 240367618. 08.01.19 08:51;Account;Receive;Received Payment 0.51 USD from account U17520550 to account U1294000. Batch: 242041336. Memo: API Payment. Withdraw to allhyips from Commercial Drones. 08.01.19 08:51;Account;Receive;Received Payment 0.51 USD from account U17520550 to account U1294000. Batch: 242041325. Memo: API Payment. Withdraw to allhyips from Commercial Drones.